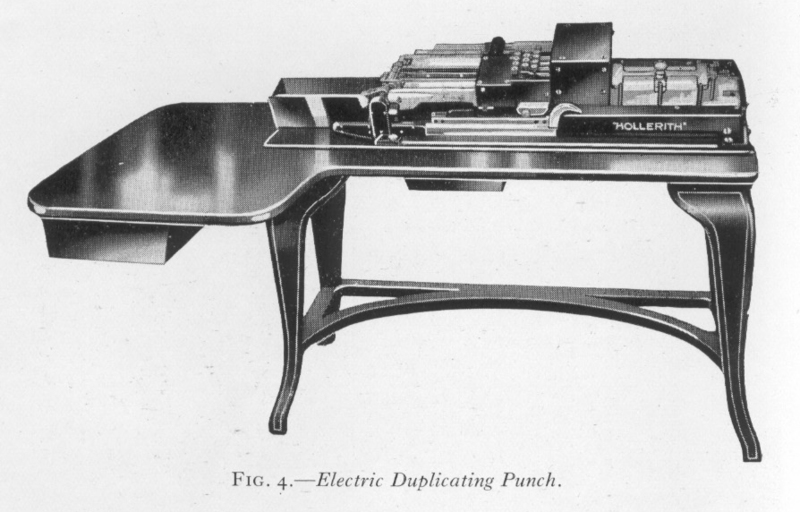 The IBM Type 016 Motor-Driven Electric Duplicating Key Punch, introduced in 1929*, the kind used in Columbia's Statistical and Astronomical Laboratories, and later in Watson Scientific Laboratory. This was IBM's first punch with automatic feeding and ejecting mechanisms; it was marketed until 1960. The punching is done magnetically, and information from one card can be transferred automatically to another by a duplicator. The keyboard contains 12 punching keys, one for each row on the card. There are also space and eject keys. A master (program) card can be used to control automatic tabbing and duplication of fields. A skilled operator could punch 100-200 cards per hour on this model.